Through its longstanding partnership with the automotive industry, JESA develops and produces successful bearings solutions for large automotive manufacturers and tier suppliers. Active in vehicle lighting systems, security, and motion control actuators, JESA present their latest achievements with motor driven actuators for automatic vehicle tailgate system. JESA will attend the Hanover fair for the third time in April 2013, located at Hall 22: Motion, Drive & Automation. With a completely new stand, the Swiss company will present its latest technologies and innovative solutions for markets such as automotive, industrial, medical, construction and consumer goods. Precision tailored bearing solutions combining bespoke ball bearings and engineered polymers will be presented throughout this, the biggest industrial fair in the world. The JESA team is looking forward to welcome you in Hannover. Do not hesitate to contact us for your free entry ticket and to schedule an appointment with our team during the show. You can also click here and register yourself for your free entrance ticket. Instead of the traditional year-end gifts to customers, partners and suppliers, and for the second consecutive year, JESA has decided to sponsor a worthy organization. For 2013 the Jesa employees have chosen to support an integrative nursery “La Coccinelle” in Fribourg. The ethos of this nursery is to universally welcome children of 2 to 6 years old with various disabilities along with mainstream children. This nursery was founded in 2006 and was the brainchild of Ms Von Zelewsky and Kessler-Steinmann. The donation from JESA provides funding for hardware, infrastructure and play equipment for all the children. To celebrate the donation, JESA asked the children to creativity draw the Jesa brand identifier the “robot”. 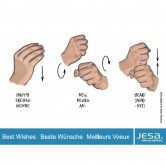 We were delighted to receive fourteen drawing, the results are visible in the Jesa 2012 greeting card which we have sent to all our customers and associates. JESA warmly thanks our business partners and employees for their excellent collaboration with this year-end gesture. On November 28, JESA was awarded the 2012-2013 innovation awards of Fribourg. The award was presented at a ceremony organized by the Economic Development Agency of the Canton Fribourg. JESA was awarded the top prize from more than a dozen other innovative SMEs with Jesa’s innovative assembly process and plastic injection techniques. This award reinforces once more that JESA is truly an innovative company. The judging panel found that the JESA solution shows that a company can be globally competitive and win new markets through innovation and investment in R & D.
It also shows that innovation must not only be on products, but also on internal processes. This award is a symbolic step on the road to the integration of “innovation and continuous improvement” in the Jesa business and encourages JESA to strive for even more. Finally, this coveted award primarily recognizes the tremendous work carried out internally at Jesa. Although Jesa is a business, JESA is in essence a excellent team of enthusiasts. This award rewards all our employees who, through their commitment and contribution in their daily work, contribute to the success of JESA. For over 40 years, JESA has been the preferred partner of industry solutions for bearings with or without overmolded plastic around the world. To meet the strong market demand and the needs of its customers, JESA is delighted to announce the introduction of needle bearings to its line of standard and custom bearing solutions. Indeed, after repeated requests from the market and after a thorough study of the situation, JESA has taken this strategic decision to create a dedicated team for needle rollers bearings. After several months of research, development and testing conducted by the JESA engineers, needle bearing solutions are now added to the range of JESA solutions. 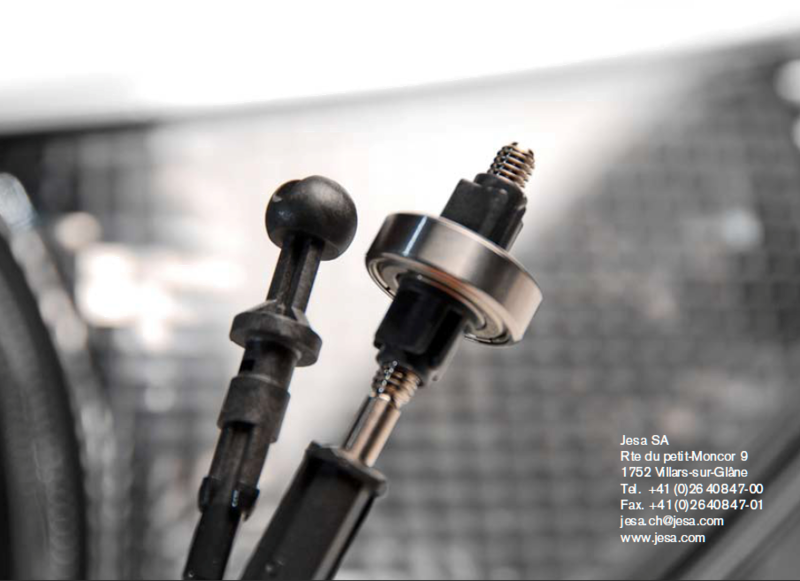 In addition, JESA’s research in terms of new steel alloys in collaboration with Swiss universities have yielded many innovations, an example being exclusive steel with exceptional mechanical properties to optimize your application is now available from JESA. During the month of October 2012, JESA will exhibit its new products and its expertise in customised solutions combining bearings with engineered thermoplastics. Visit us at our new booth No. A1-1230 in Hall No. 1 “Rothaus” to discover our innovative solutions. Did you know that sometimes, polymer with carbon or glassfiber reinforcing technology can be mechanically more suitable than the metal or alumimuim? Our team of specialists will be happy to welcome you and to explain the added value of combining metal and plastic in dynamic solutions. Feel free to contact us to schedule an appointment with our experts on site and to order us a free entry ticket. The automotive industry can be a very demanding market to serve, recently Jesa Switzerland demonstrated its complete design and manufacturing flexibility and responsiveness for an urgent requirement. The Jesa system process proved itself to be robust, enabling Jesa to produce fast prototypes for customer testing. Using JESA’s 43 years of experience, the customer found out first-hand how innovation, speed and flexible manufacturing techniques can be realized, to the customer benefit. This type of 100% service and innovating solution can be demonstrated by Jesa when the need arises, which in many industries is becoming more prevalent. However, we wish to specify that this process was exceptional, special and unique because of its urgency level. We hope you enjoy reading the case study. JESA is your partner for developing “spinning solutions” combining the advantages of ball bearings and polymer injection. Our “spinning solutions” moves the headlights of the most famous German car manufacturers. It’s a perfect combination of a ball bearing with engineered polymers to assure the perfect and smooth control of Xenon headlights in the horizontal axis. Precisely and consistently controls the Xenon headlight movement for directing the Xenon beam as the vehicle turns the corner. These powerful lights should not “blind” oncoming vehicles. For several years now, JESA has been producing units that combine a ball bearing, a steel insert and an over moulding, and a polyamide-type polymer under moulding. These units are integrated in actuators for xenon directional headlamps for the automotives market. This type of unit was originally only found in top-of-the-range vehicles produced by cutting-edge manufacturers. Today, directional headlamps are becoming more widespread and are now offered as standard on many passenger car models. We are proud to state that JESA technology is found at the heart of these systems. In 2011 we reached the milestone of 25 million units produced, representing no less than around 12 million vehicles equipped with JESA units. Does your car use JESA technology ? With over 10 years of experience in the field of vehicle illumination, we are delighted with the confidence placed in us by the various partners with whom we have collaborated on these numerous projects. And, with much pleasure and great interest, JESA is looking forward to future generations of lighting and to working with its customers to develop new products with a view to facing new challenges. Its main aim, of course, is to improve driver safety and comfort, and ultimately to help save lives … who knows? “Tough challenges require customized solutions”. That’s why JESA focuses on customizing products according to customer and industry needs. On these pages you will find at the top right of the document some tools allowing you to share these case studies with your network. Feel free to share information on social networks like Twitter, Facebook and LinkedIN. You can also monitor and receive freshest news about JESA through our pages on LinkedIN and Twitter that can be accessed from small icons found on the footer of our website. If you want to be informed of innovations and new products, you can also sign up for our newsletter. We hope you enjoy reading our case studies and please do not hesitate to contact us with any questions or requests for information. We’re here for you. With 40 years of experience as a specialist manufacturer of metal-plastic alloys, JESA will be taking part in the main industry event for plastic materials in Switzerland. Swiss Plastics will be held in the wonderful city of Lucerne in January. Don’t miss this chance for a superb excursion into the world of technology! We hope you will join us and look forward to welcoming you to our stand. We hope you enjoy your visit to SwissPlastics.